The suspected gas attack reportedly left more than 40 people dead. Rubble fills a street in Douma, the site of a suspected chemical weapons attack, near Damascus, Syria. The suspected 7 April gas attack on Douma, near Damascus, reportedly left more than 40 people dead and was blamed by Western powers on the regime of Syrian President Bashar al-Assad. In response, the US, France and Britain conducted missile strikes on Syrian military installations, but Paris admitted yesterday they were a matter of “honour” that had solved nothing. Syrian Ambassador Bashar Jaafari told a meeting of the UN Security Council in New York that the team of experts would begin work on Wednesday once they receive the all-clear from the security detail. If this United Nations security team decides that the situation is sound in Douma then the fact-finding mission will begin its work in Douma tomorrow,” Jaafari told the council in New York. The Syrian state news agency SANA earlier reported that the international experts from the Organisation for the Prohibition of Chemical Weapons (OPCW) had entered Douma to begin their investigation of whether chemical agents were used as a weapon. Jaafari stressed that the “Syrian government did all that it can do to facilitate the work of this mission” but that it was up to the United Nations and the OPCW to decide whether to deploy, based on security considerations. The inspectors arrived in Damascus on the day of the Western strikes but had not been allowed to enter Douma. France and the US appeared to question the purpose of such a mission. Russian foreign ministry spokeswoman Maria Zakharova hit back, calling the accusation “very surprising” and saying that Russia had supported the inspection. Several experts have said any investigation at this stage was likely to be inconclusive. “As with any crime scene, it is crucial to get there as soon as possible,” said Olivier Lepick, a fellow at the Paris-based Foundation for Scientific Research. “If the Russians and Syrians have nothing to hide, it’s strange that they would wait 36 to 72 hours,” he said. It’s probably to give themselves the time to finish cleaning up. In an impassioned defence to the European Parliament yesterday, France’s President Emmanuel Macron said Saturday’s strikes had been “for the honour of the international community”. The French leader was also set to strip Syrian President Bashar al-Assad of the prestigious Legion d’Honneur (Legion of Honour) award he was granted by former president Jacques Chirac in 2001. The war of words continued to spiral between the Russian-backed Syrian regime and the West but a military escalation looked to have been averted. A report on SANA that Syrian air defences had shot down missiles over Homs province overnight raised fears, but the agency later retracted the report. The Britain-based Syrian Observatory for Human Rights reported explosions were heard near Shayrat air base, southeast of Homs city, and near Damascus where two other air bases are located. After Saturday’s strikes, which destroyed mostly empty buildings, the trio of Western powers trying to reassert influence on the seven-year-old war have appeared to favour diplomatic action. The three allies have put forward a Security Council draft resolution in a bid to relaunch talks aimed at ending a war that has left more than 350,000 people dead and displaced more than half of the Syrian population. “For a new diplomatic initiative to work, the balance on the ground must be changed,” said Nabeel Khoury, a former US diplomat who is now a fellow at the Atlantic Council think-tank. “As it is, even with this latest bombing, the West does not have a seat at the table,” he said. Russia appeared in no mood to extend a hand to the West on Syria however and its ambassador to the UN, Vassily Nebenzia, called the diplomatic push “untimely”. 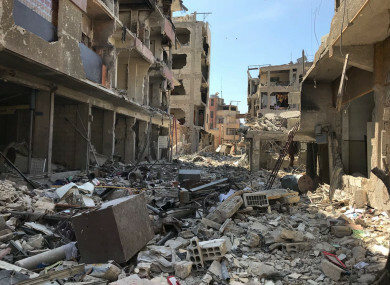 “If the goal is to force a Syrian president, under a hail of bombs, to sit at the table of negotiations… this goal is simply unrealistic,” Nebenzia told the Security Council. The latest round of diplomatic maneuvring comes as US-backed Kurdish forces fighting the Islamic State group face a Turkish assault in northern Syria. That has prompted many fighters to quit the battle against IS in order head for the Kurdish enclave of Afrin. The US military, which heads a coalition against the Islamic State group in Iraq and Syria, said yesterday it had seen the jihadists “resurge” in some parts of Syria under government control. Email “Chemical inspectors await all-clear to begin work in Douma”. Feedback on “Chemical inspectors await all-clear to begin work in Douma”.